As a huge fan and collector of minifigures, I instinctively bought this set within just a couple of days of hearing about it on a certain Lego community site. 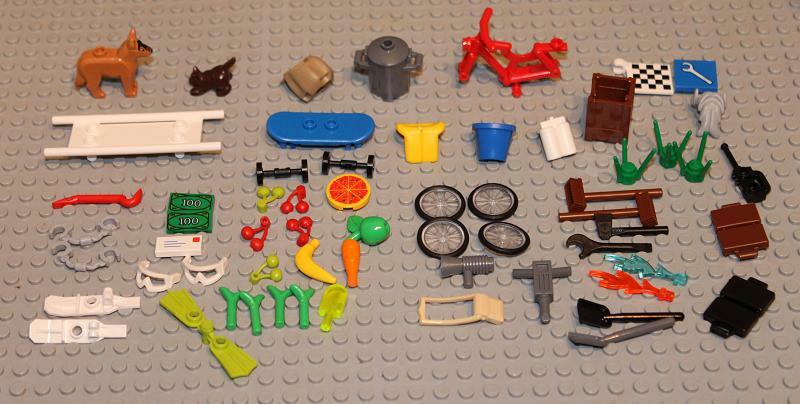 Despite a considerably large price tag, the main draw towards this minifigure set is the inclusion of several new, unusual and/or rare parts, including a green bicycle, yellow hard hats and food items. 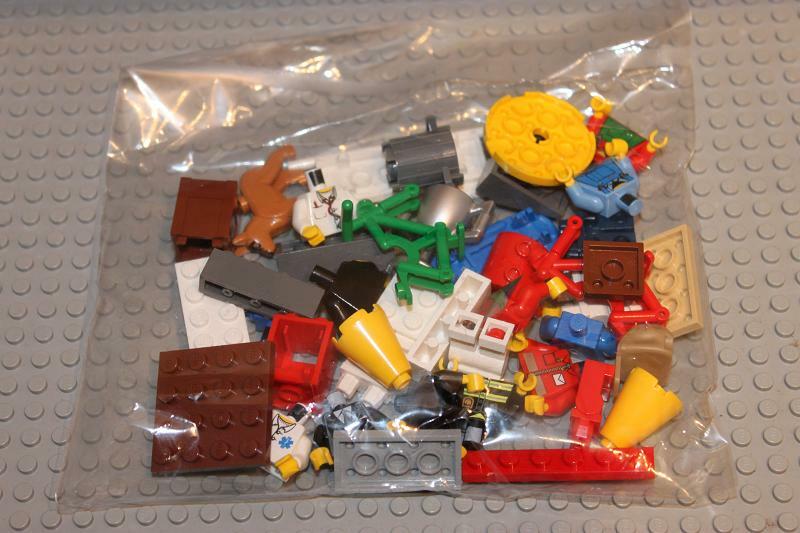 Contained in the box are all the parts required to build 22 minifigures – all shown on the front and back of the box – and their accompanying props. The largest of the bags, containing the coveted green bicycle frame as well as the new printed dog. Here we can see a selection of torsos and legs, and – if you look very carefully – a dark brown cat. 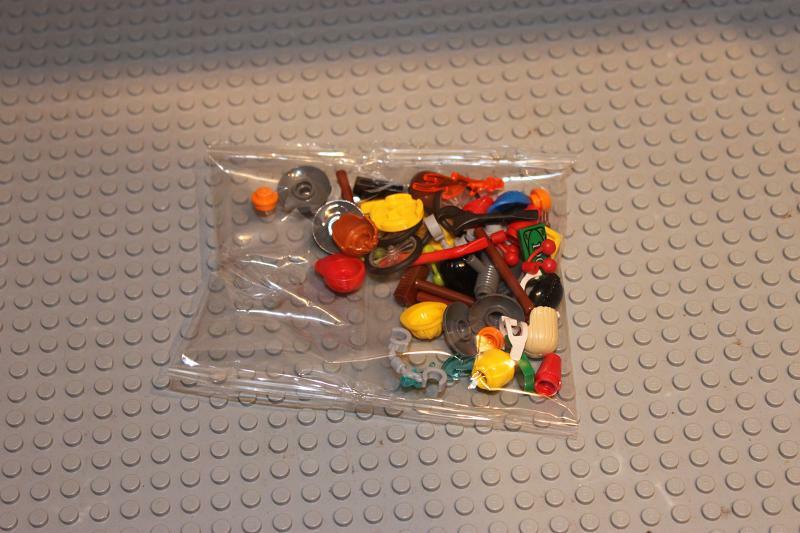 Some of the smaller parts, including several minifigure heads. Funnily enough, all of the female heads are in this bag. 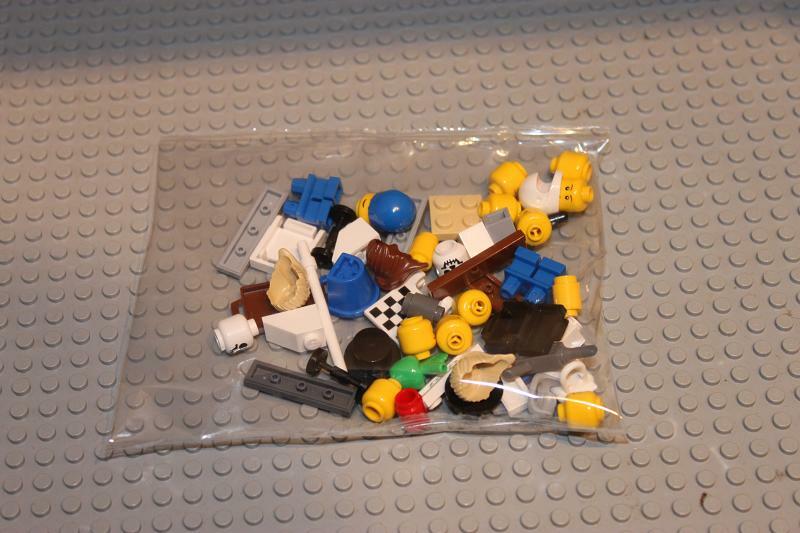 A few hairpieces, some tiles and the male minifigure heads are in this bag. 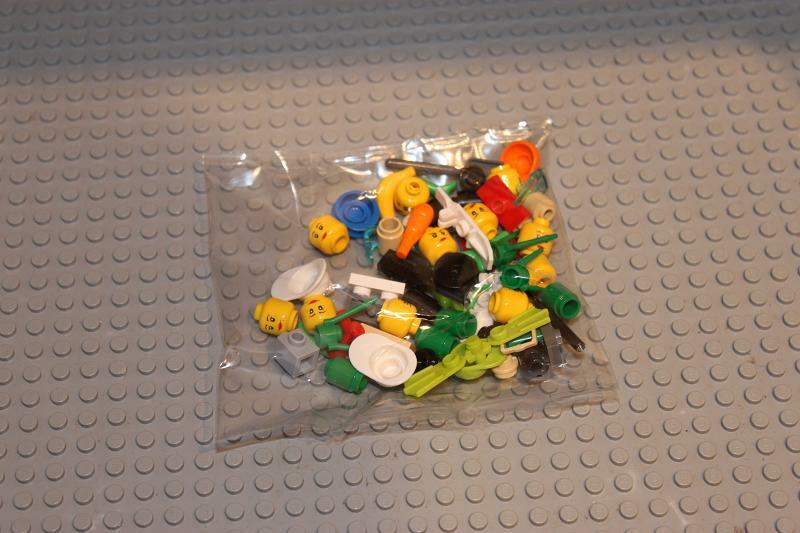 The last and smallest of the bags contains the smallest elements, including printed money tiles and visors for the helmets. First on the agenda are the torsos, being the first parts I’d paid attention to when opening the bags. I primarily collect torsos. Somewhat disappointing about the selection of torsos is that you can find most of them in a Lego store’s Build-A-Minifig section. The selection is made up for by the other, not-as-common ones: it’s great to see alternative construction torsos, as well as a “courier” torso (top right), for example. I’m not too sure about the postman’s torso (the red one at the bottom). The print quality on all the torsos is very good. The legs on offer. Three “stubby” legs for the kids, but standard Build-A-Minifig fare all round. 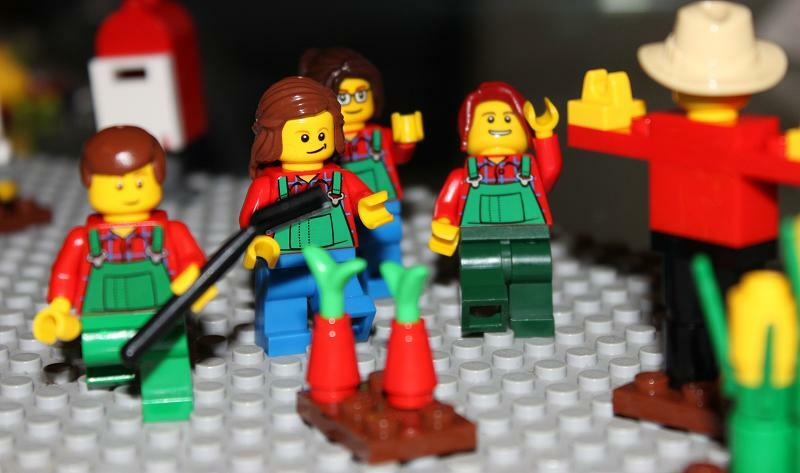 The minifigure heads are evenly distributed: 11 females to 11 males, with two “skeleton” heads. Unfortunately, all the female and male heads are exactly the same – and I’m not keen on either design. Particularly for the females, it would be nice to have some variations. 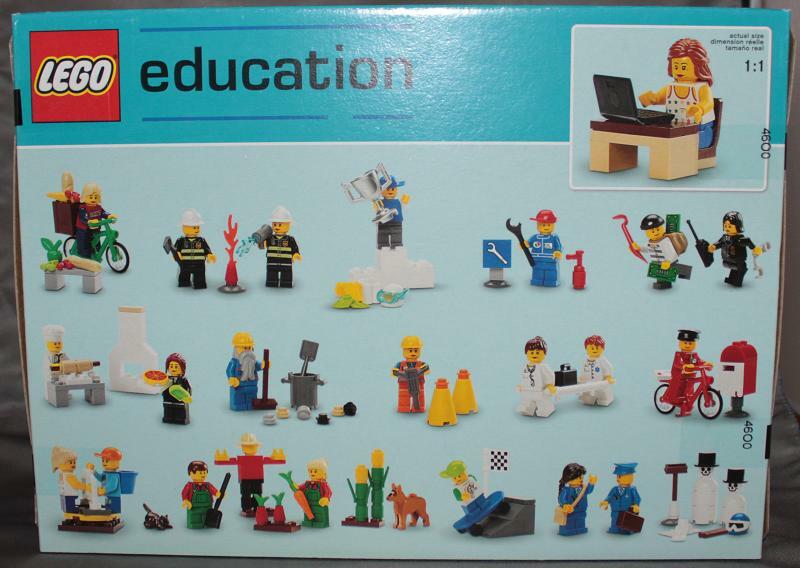 But this is an educational set after all. Note that the female heads are double-sided: one side is smiling, the other has a frown. Strangely, the design has “crows feet” and “beauty spots” as standard. To make up for the duplicate heads, we have a range of head- and hairpieces. Some of these are used as props on the box cover. The tan cowboy hat, the new baseball caps (particularly in lime and orange) and especially the yellow construction hats will be the most desired of these parts. 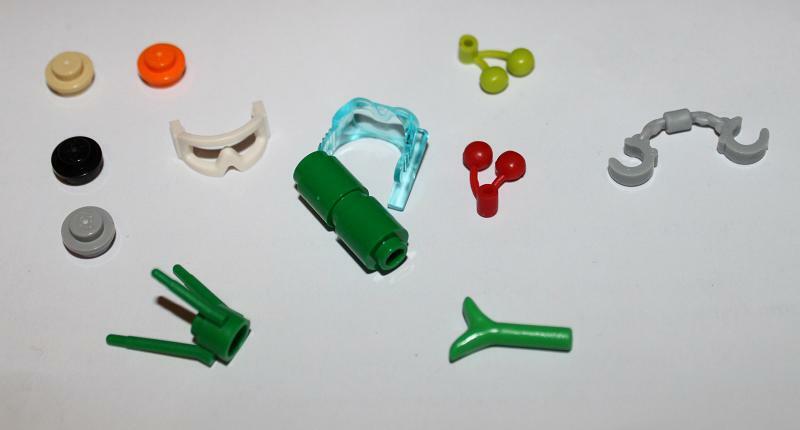 These are most of the accessories included in the set. Like with the headwear there’s a good mix of classic and new elements, including the new tan “swag bag” and the strange red crowbar. I remember back in primary school, when I was first exposed to Lego: it was all about the walkie talkies. These bricks are included if you want to build the props. Or, more practically, you can add them to your collection. Just a few regular parts here. 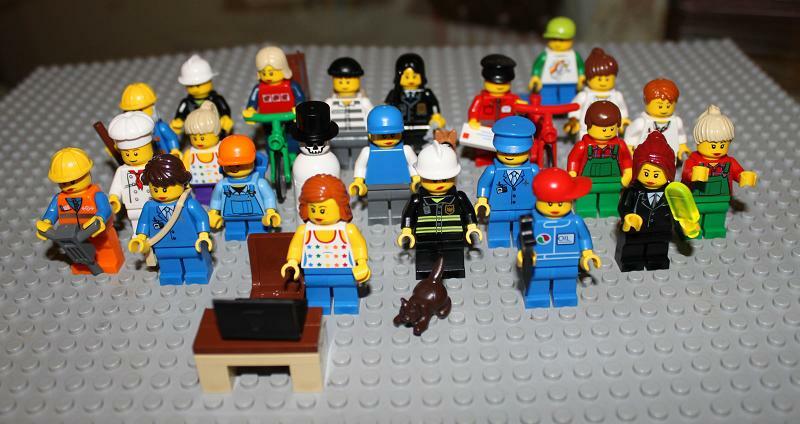 Probably the most coveted part in this set (behind the yellow hard hats) is the green bicycle frame. Before coming out of the “dark age”, I had only been exposed to red bicycles – these, and frames in other colours, are hard to come by. 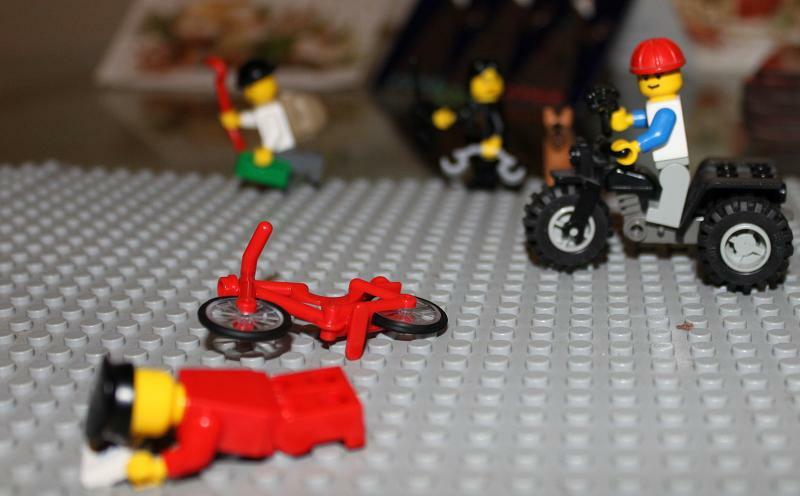 (Sadly I’m having to part with my yellow bike.) The baguettes seem to be exclusive to large expensive sets, although my first exposure was from the 2010 City advent calendar. The folding laptop also makes a brief comeback. … There is no[/i] literature. No instructions, no printed leaflet, [i]nothing[/i]. 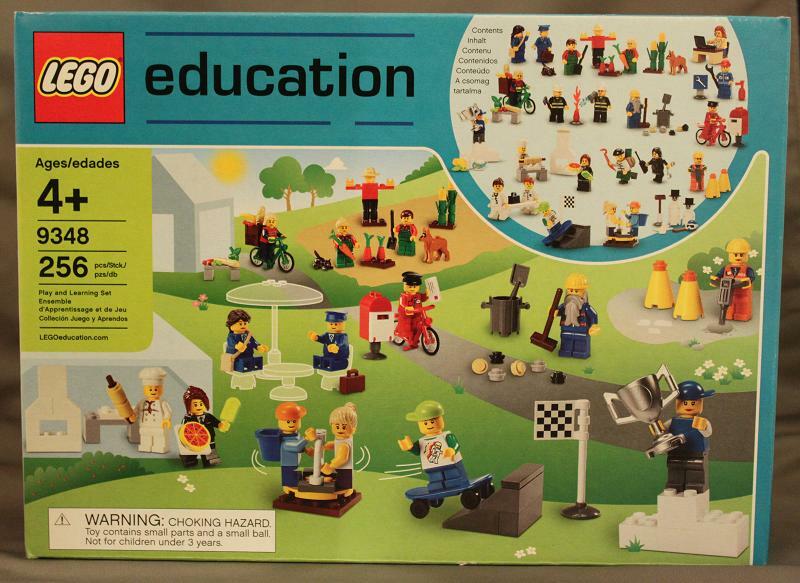 They weren’t kidding when they said it was an [i]educational set – if you want to build anything, you’ll have to figure it out yourself! Whether or not an instruction book – or any printed material at all – is necessary for this set, really depends on the end user’s skill level. Some would argue that, if they really need instructions to build these things, they should be doing something other than playing with Lego. But then again, this set is marketed for kids aged 4+. While I don’t think instructions are absolutely necessary, someone unfamiliar with Lego parts might have trouble building some of the props. It might not be immediately obvious to construct the turntable piece for the roundabout, for example. Without further ado, the showcase. 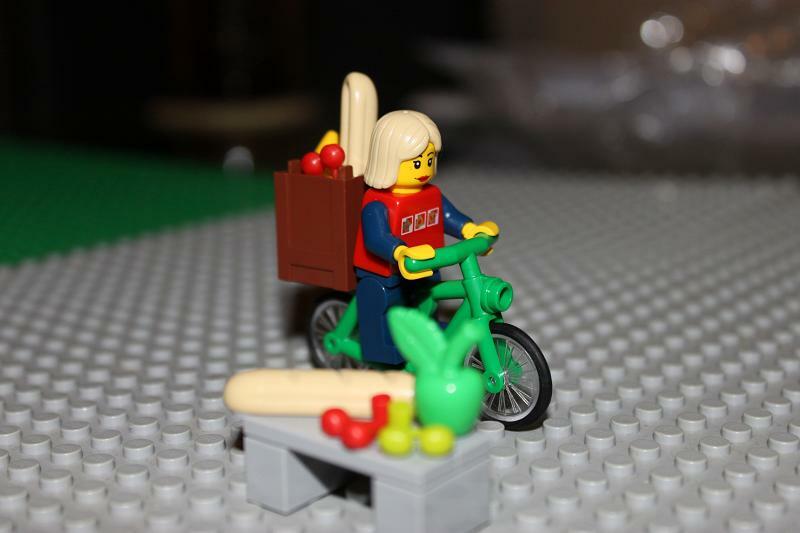 A female courier on that rare green bike, with a shedload of food. Probably the most impressive display in the whole set. A male and female firefighter: the female has a makeshift fire hose. 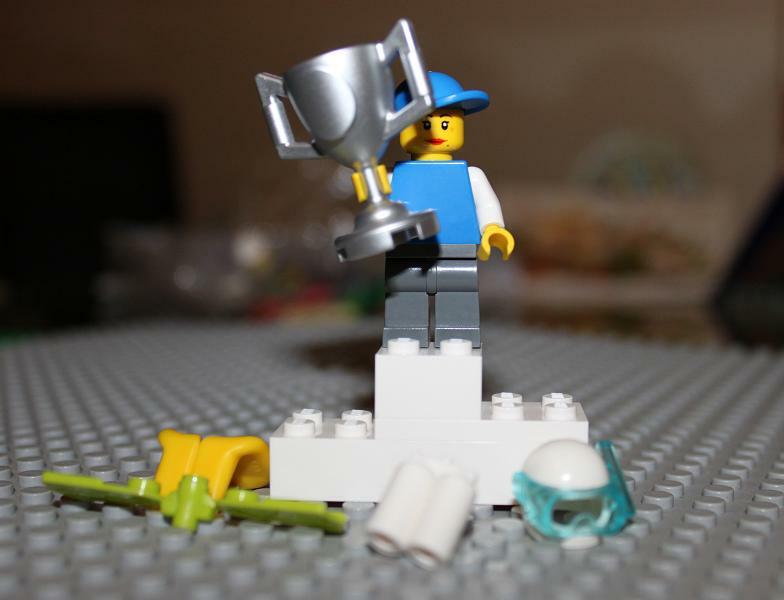 An award-winning scuba diver of sorts, complete with humongous silver trophy. Possibly the loneliest winning ceremony in history! 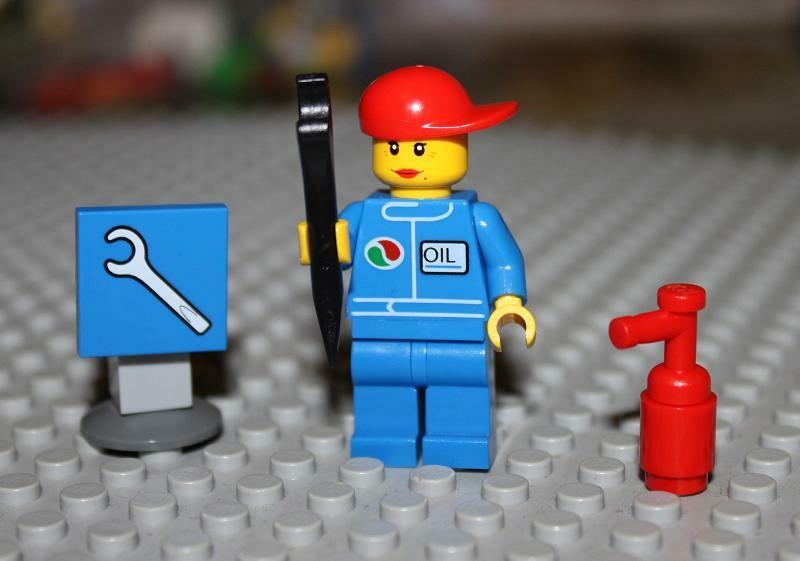 A female mechanic, with her tools of the trade. A female police officer eager to arrest a young offender. 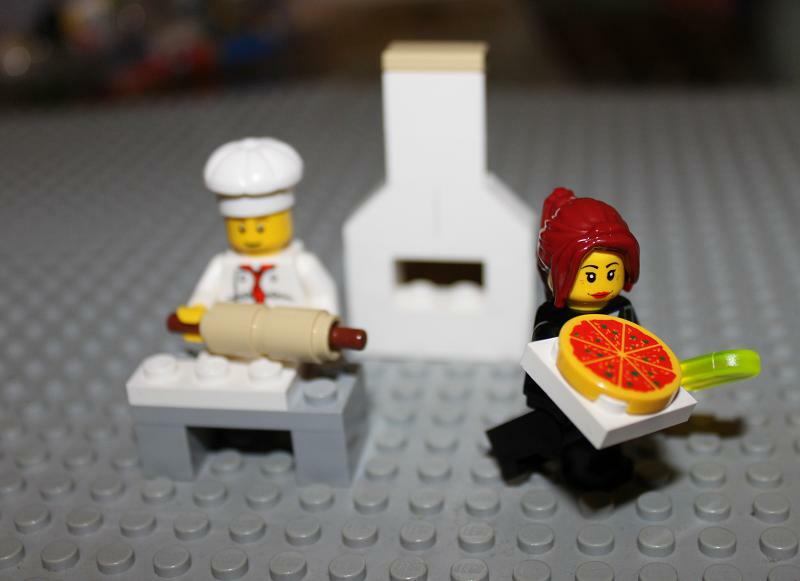 A female waitress serving pizza and an ice lolly. This, in my opinion, is the best use of the generic female head. 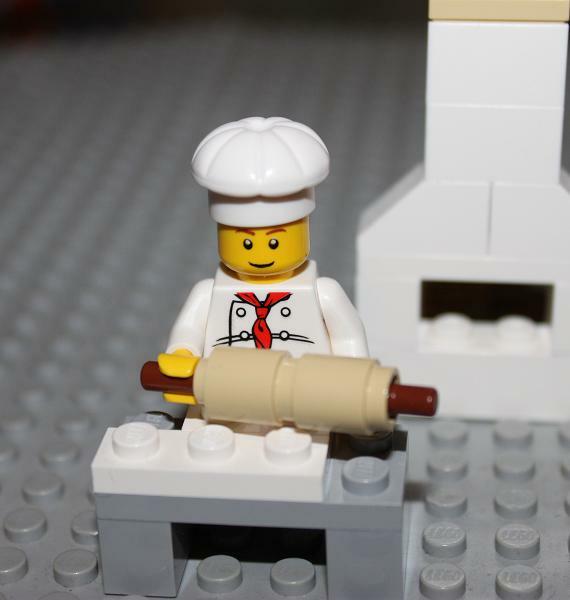 The head chef of the pizzeria, rolling his dough. 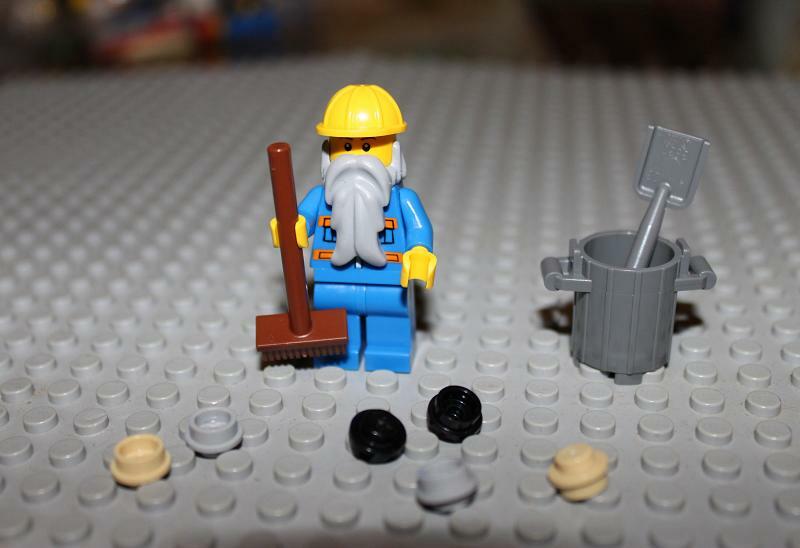 This poor guy has to sweep litter for a day job, and it doesn’t look as if it gets any easier. 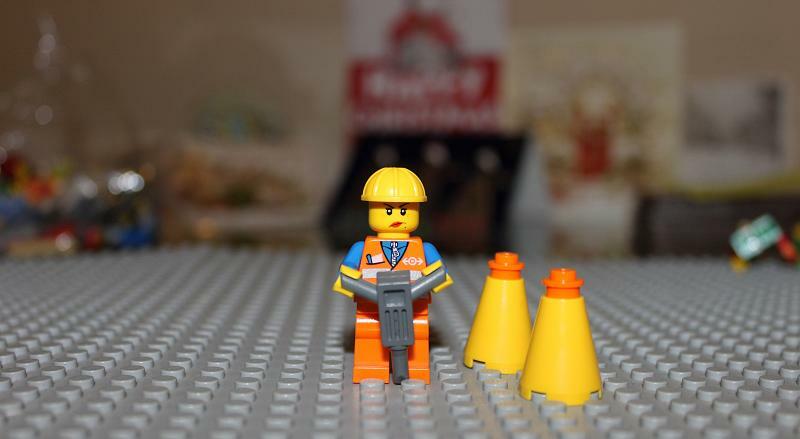 A female construction worker, who is really into the job. Postman Pat has been downgraded; he says he’s being green. He looks more at home in a post office than outdoors. Two kids on a very small roundabout. 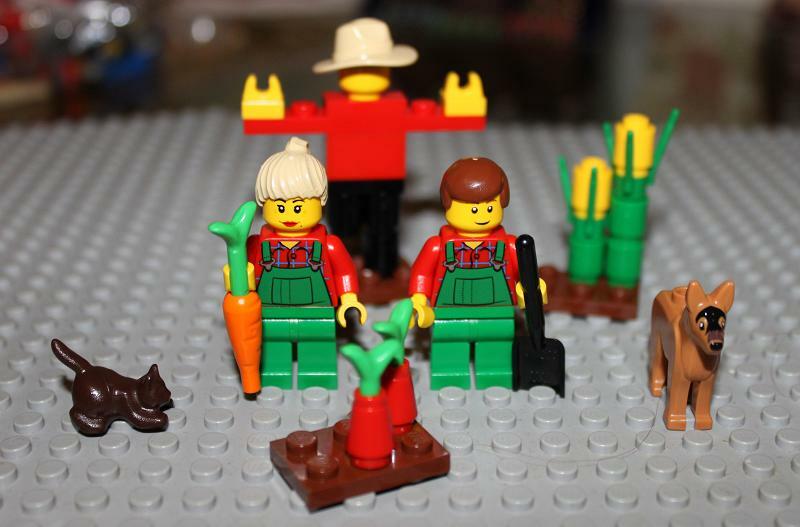 A husband and wife farming team, complete with pets and a scarecrow (which uses the plain yellow minifig head). Kid. Skateboard. Ramp. The best thing about this set is… the lime cap. On closer inspection these two are actually airport staff. 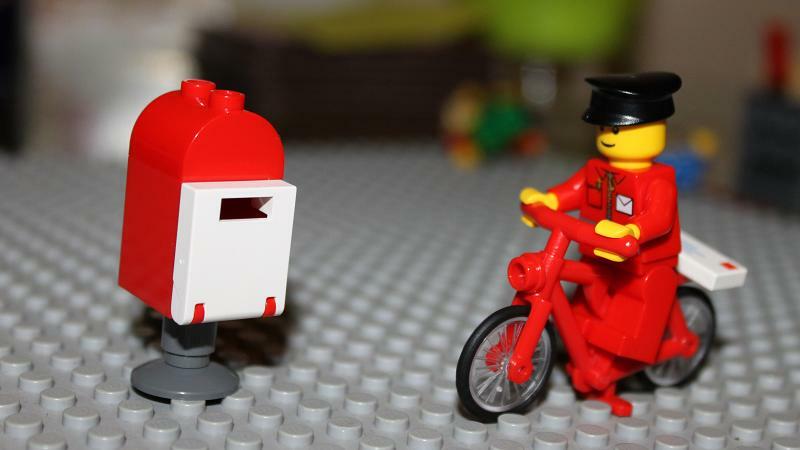 Personally I think they’re better suited as posties! In the background are the Baron Samedi reminiscent snowmen, complete with the remains of a skiier. Finally we have a frustrated receptionist, trying to work an old laptop with Windows 95 installed on it. For your money’s worth you get two of the uncommon round green bricks. All of these parts, except for the goggle visor, will have some use in the future. The Fuschia Sisters make an appearance on the city farm. The world’s first postal postal victim. 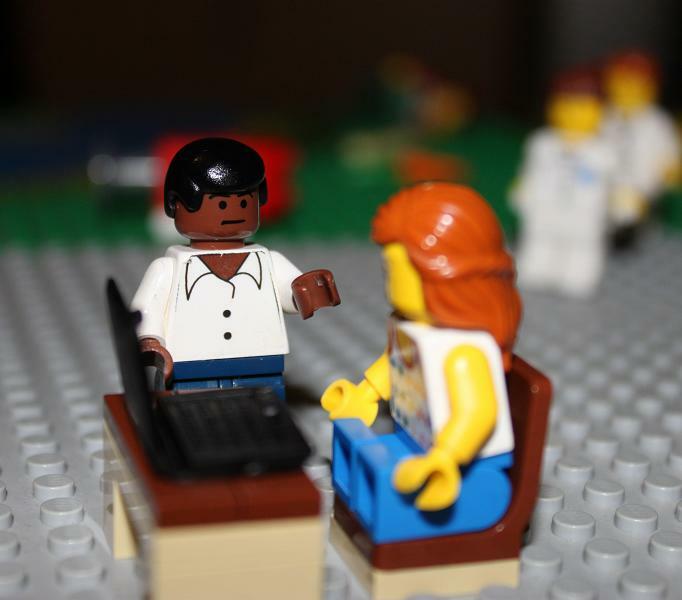 The receptionist gets chatted up by someone who knows a few things about computers. Just one of these sets gives you an instant town population, and plenty of useful accessories to play with. Best of all, you’re not entirely restricted to instructions in a manual, or even what you see on the box, for long term enjoyment. The only concern I’ve had from the beginning was the price. At GBP 39.99, it’s a very far cry from the smaller minifigure packs of old, and it raises a lot of doubt as to whether or not buying this particular set would be worth it. 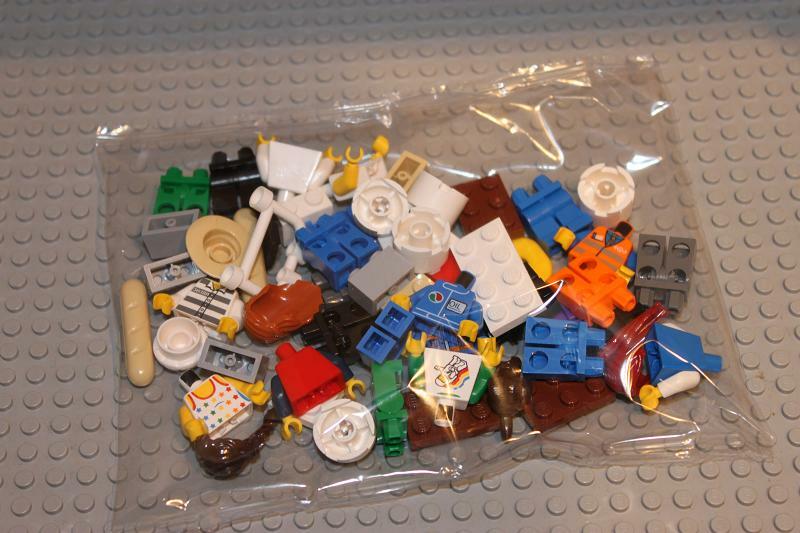 For the price of this set you could get around 34 Build-A-Minifig figures, or 20 Collectible Minifigs. I’d say that whether or not to go for this set depends on your motives. 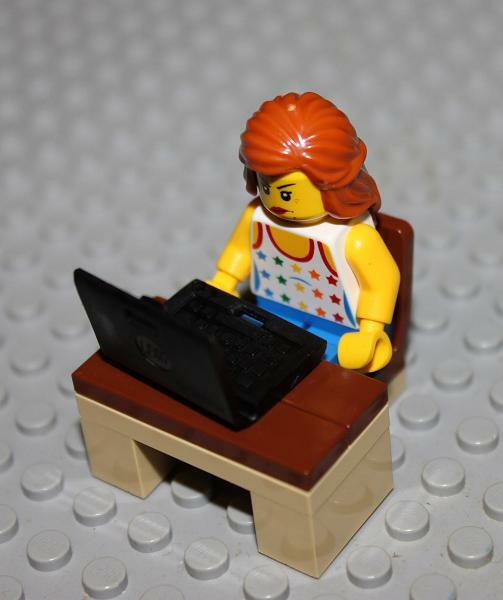 If you want it solely to get hold of specific parts, you’d probably be better off getting them on BrickLink – it depends how many parts, and how many of them, you’d be after. 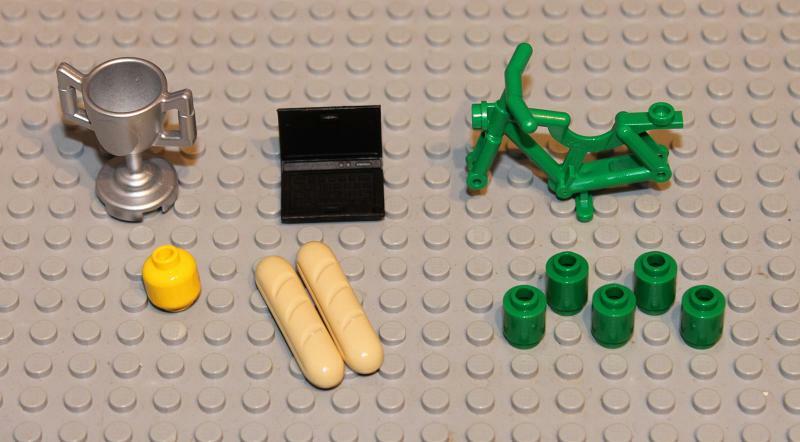 I would recommend this set for building a collection of generic Town minifigures, with a bunch of very useful accessories as a bonus – although if you’re after a number of specific generic figures, it would be less expensive to go down the Build-A-Minifig route. Build: 7/10 – building isn’t necessary or worthwhile, perhaps apart from the pizzeria scenario. No instructions for the kids to build the models on the box. Parts: 9/10 – a lot of great parts, particularly food items, headwear and bikes. 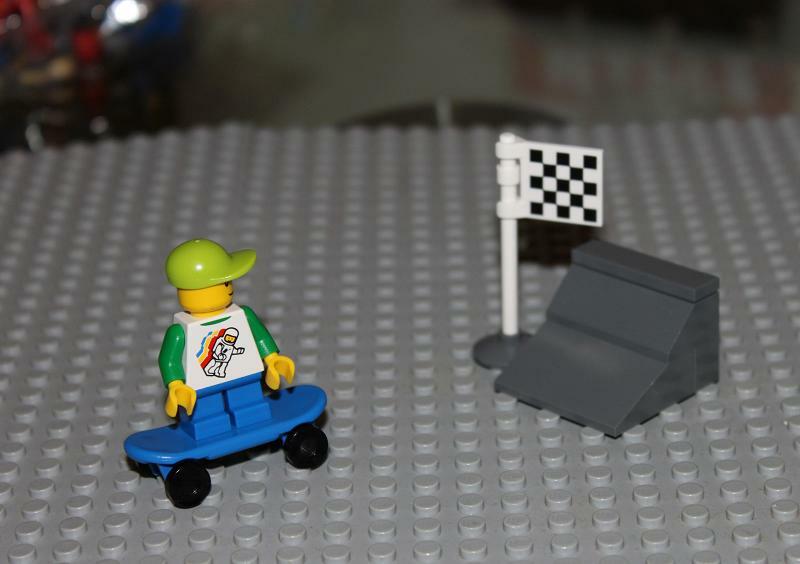 Figures: 8/10 – the Build-A-Minfig staples are saved by the other figures in the line-up. Airport and pizzeria staff are the favourites. 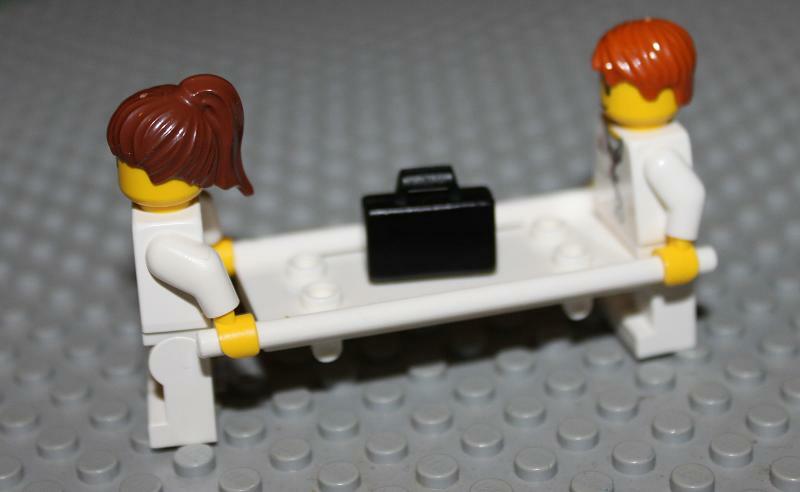 Playability: 8/10 – although each has a specific role, there’s no limit to what can be done with the minifigures (and other parts). 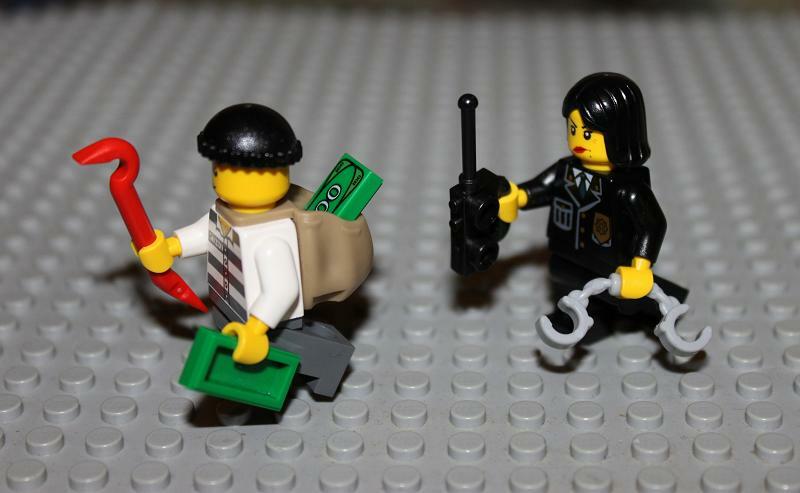 Price: 4/10 – for a minifigure set the RRP/MSRP makes it difficult to buy. 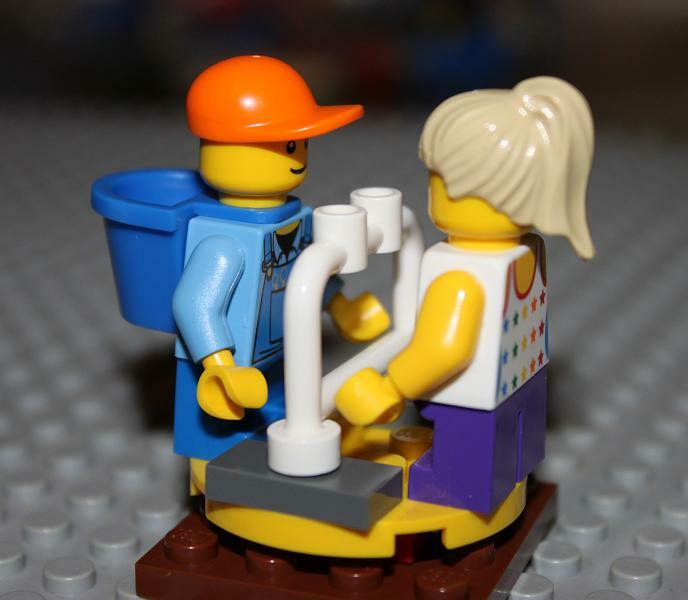 As a retail set, the accessories are the primary selling point – but contrasted with the price and the generic selection of minifigures, it would most likely be a one-off purchase. 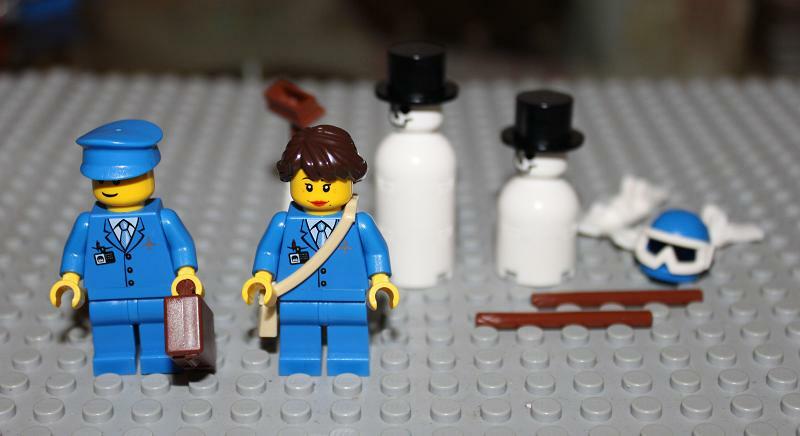 Replacing the bricks with a few more accessories, or adding variations to the minifig heads, would improve the set.